IT’S EASY TO GET sucked into the promise of low taxes. And, I have to admit, last week I was sucked in too. On Thursday, Feb. 7, 2019, the City of Kamloops staff and council presented the provisional budget to the public at a budget open house. The City has been releasing budget information since December, so it wasn’t too much of a surprise when the numbers were put forward. Even so, when the director of finance Kathy Humphrey presented the expected tax increase, less any supplementary items, even I was surprised at how low it was. At 2.26 per cent, the tax increase was below all of our comparable cities in B.C., and in many cases well below. Kelowna (4.40 per cent), Prince George (5 per cent), Nanaimo (5.03 per cent), Port Moody (7.36 per cent) and a host of other cities are facing increases well above Kamloops. That’s what Coun. Mike O’Reilly stated in essence when he tweeted “Kamloops is looking pretty good so far”. 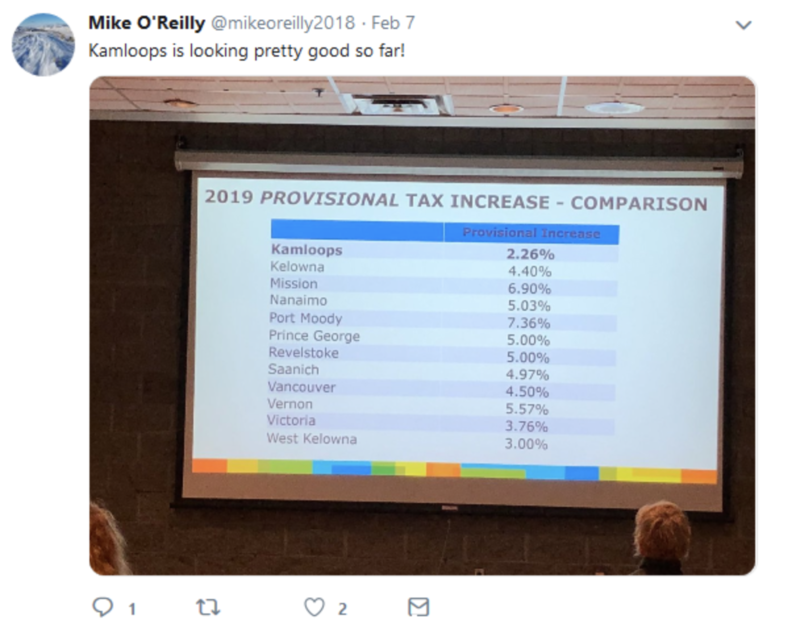 And I agreed, when I tweeted back, “Kathy Humphreys should show year by year increases” knowing Kamloops increases have been low for years, so that the year to year increases were impressive too. I got sucked in to the promise of low taxes. It doesn’t take long to see where low taxes can get you. The council and City staff were barely tucked warm in their beds Thursday night after the budget meeting when City crews were out dealing with burst water pipes behind the courthouse on Columbia Street, and other burst pipes on Greenstone Drive. The paper reported unseasonably cold temperatures to be the blame. But the coldest record in Kamloops in February is -28C, and the lowest on record was a January day of -37C. In any case, the temperatures we have experienced are not outside of expected. What is also expected is that old pipes burst, and money needs to be spent upgrading infrastructure. As our city’s infrastructure ages, we need to spend more, not less on replacing what we have. We need to pay more taxes. Let’s start with the pittance of 3,000 more transit hours in the supplementary budget. There were 3,664,952 rides on Kamloops transit last year. That’s an increase ridership of 5 per cent, and yet transit hours increases lag behind. One lost opportunity is the option of adding School Special transit buses for schools of choice. There would be a huge reduction in traffic congestion if kids could take transit buses to the Kamloops School of the Arts, the French Immersion schools, the sports academies and other schools of choice. Not to mention there is no mention whatsoever of expanded hours for Handidart, essential for so many seniors and people with disabilities in Kamloops. Forty-eight of our friends, family and co-workers died in Kamloops from opioid overdoses last year, but there isn’t a mention of any services for the opioid crisis in the City of Kamloops supplementary budget, either. Nothing. As in zero per cent increase in taxes. I don’t buy the argument that health care isn’t a city’s concern. Our citizens’ wellbeing is central to the operations of the City of Kamloops. The City could be partnering with Interior Health to provide health services at the TCC (as is already done for heart disease). Or rather than just hiring Eco-smart youth, hire some peer outreach workers to talk to people who use drugs. New programs means more taxes. Our friends, family and co-workers are worth it. The proposed budget is great if low taxes is the goal. The proposed budget is great, if we want things to stay the way they are. If we want our infrastructure to crumble around us, traffic to become more and more annoying, and opioid deaths to be ever present and increasing. Or, given that we don’t pay that much, and we live in a fantastic place, this could be the year that council bites the bullet and says we can do more. Kamloops is an amazing place to live. We have a vibrant city. People want to live here. Yes, we can pay low taxes. But, this year, let’s make a difference. 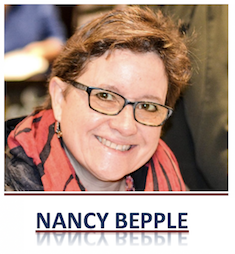 I see that Bepple is still thinking like a free spending member of council.The amount of money wasted by council on ” studies ” about everything, when we pay ( and handsomely ) city staff to do a job that should include these ” studies ” is enormous. The many vanity projects that council agrees to, and the future ” wants “, like an overly expensive PAC, instead of controlling how money is spent, and looking after existing infrastructure are the biggest money wasters in this city. For Bepple to say that the city cannot be maintained because we don’t want to pay ( can’t afford ) huge tax increases every year is ludicrous. The city needs to start living with in it’s means , and better allocating the money it has. After taking a few days to think about things, I still come back to the initial scene in my mind of the people at Ponderosa facing a flood (from a broken water main) and what the chances were they were imagining how nice it would be to have a dome over the Tournament Capital Centre. If the amount of disposable income is no problem with some people, that is one thing. But, the reality has become more and more that people are either on fixed incomes or make up the “working poor”. Until there is more than one taxpayer base, I think there has to be some priorities made in how public money is spent. Regarding taxes, higher levels of government should “crack the whip” with gusto towards tax evaders and cheaters. Can’t reacall the figures right off the top of my head but I believe the amounts are substantial. Locally, it is important to remember a high degree of accountability is of tantamount importance.